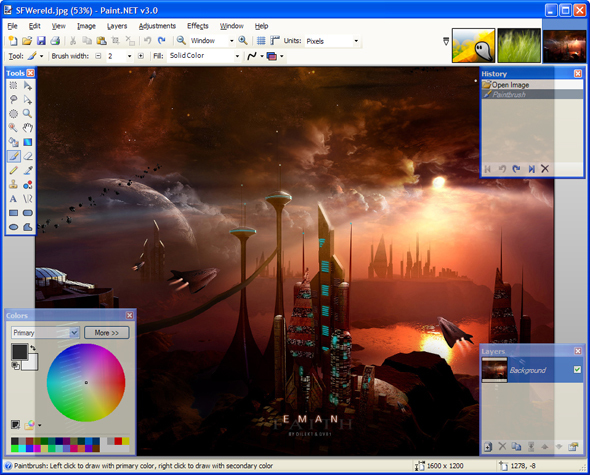 This program is a real must have if your looking for more then just MS Paint that comes with Windows! Interactive Gradient Tool that makes it very easy to draw and then fine-tune placement and coloring of a gradient. History files are now compressed to save disk space, reduce disk activity, and improve performance. Everyone is looking for a good free firewall. Gratis Software Site tested a few free firewalls. There conclusion is that the firewalls who are all ready a while on the market -ZoneAlarm , Sunbelt (previous Kerio)- loose it from the newcomers. You can read the whole test on there site (dutch). The winners of the test are: PC Tools Firewall Plus and Comodo Firewall Pro. PC Tools Firewall Plus for being the most user friendly. It is an great choice for beginners and average computer users. Comodo Firewall Pro. It offers the best protection but is harder to configure. Therefor perfect for experienced computer users. The fourth installment of Spiral Graphics Inc’s popular line of free seamless texture packs has been released. With the latest pack more than 150 textures have been added to the collection, bringing the total number of freely downloadable seamless textures to approximately 600. The new pack, which contains terrain textures of all types, can be found here. The textures are available in resolution-independent procedural form (GTX), as well as pre-rendered JPEGs. GTX textures can be fully edited using the Genetica seamless texture editor. Genetica provides a flexible node-based approach to texture generation that will empower you to create realistic new materials in record time. A downloadable demo of Genetica is available here. For artists without the full Genetica application, the free Genetica Viewer is provided as a quick and easy way to take advantage of the GTX-format textures. Using Genetica Viewer, numerous embedded effect maps can be rendered for the textures, including bump and specular maps. Genetica Viewer is available here.